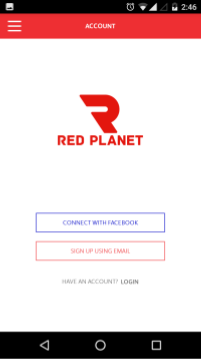 Below is the review for the Red Planet app from the Play Store for Nimbl3, dated July 2016. 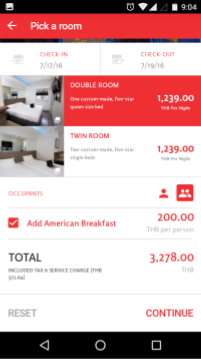 First of all, as a single-branded hotel search, it needs to very clearly communicate, why it makes sense to have it installed alongside aggregators like Agoda or Booking, otherwise its audience is limited to the most loyal and tech-savvy clients. From what I understand, using this app while signed in gives user a 10% discount – which alone might be a good reason to install this app, but this, together with other possible benefits, needs to be announced much sooner – maybe in the app’s name, icon, or short description. That is, of course, if a goal of growing app’s user base is set. Now for the user-related stuff. The app looks clean, but I noticed some UX issues. 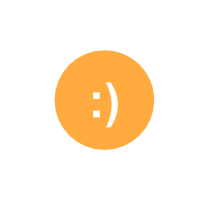 First, there is no Back button in the app header, which is usually expected there: many users prefer that to bottom/hardware back buttons, plus it helps figuring out where in the process you are and is it possible to take a step back. Second, the bottom button looks identically to the header and has no ‘button’ feeling to it and no call to action. New users might struggle even with finding it. I would recommend adjusting the app’s look towards Material Design language: this would bring UI consistency to the app. 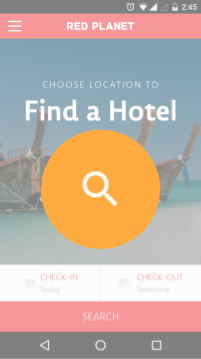 The main screen effectively gives users two (and a half) search buttons: one for finding a location, and one for performing a room search. None of that is straight-forward from the UX point of view. Furthermore, tapping the bottom ‘Search’ right away gives you a “Select destination” error. 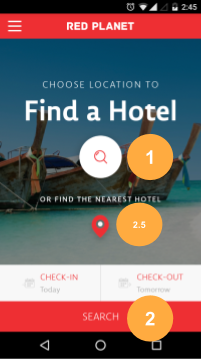 Tapping a half-search ‘Nearest hotel’ icon takes you to the check-in date selector, which is counter-intuitive. My first experience with the main screen was that everything here is random, which is not acceptable for the most important screen in the app. There should only be a single, clear search button, which instead of giving you errors take you where you can fix it right away. And the ‘find nearest hotel‘ should be an option inside the search process. 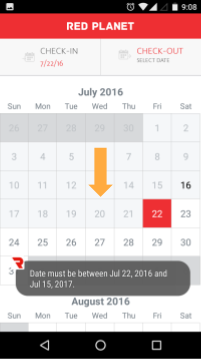 By the way, check-in dates screen is very unforgiving in terms of selecting ranges: if I accidentally select an end date before the start one, I’m in for some trouble looking to undo this, and again, not having a ‘back’ button in the header is making it worse. 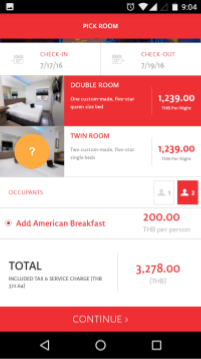 And having selected dates and location the app keeps sending the user back to the main screen so that they click the ‘search’ button, while they could already be choosing rooms. The location selection screen has issues as well. First of all, there’s a rather poor choice of styling for the city title (e.g. Tokyo) and local title (e.g. Asakusa): being the same size, the city titles are barely noticeable in between huge photo blocks where local titles are kings. It’s very confusing. Plus, users are probably not on this page to enjoy darkened sights, and those photos don’t really help telling locations apart. 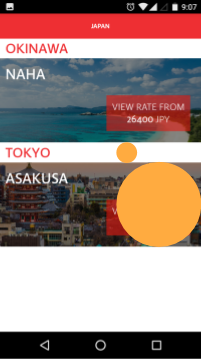 Also, in the ‘view rate from N’ block it’s easy to drop the ‘view rate…’ part as it is excessive and creates visual obstacles. More useful could be present on that screen, like stars amount or number of rooms available for the chosen dates. This list has good potential for improvement in terms of readability and usefulness. The room booking screen appears pretty logical, but lacks some seemingly expected things. Like tapping a room photo should usually lead to that photo being expanded and more room photos could be observed, although this is not the case here: the user has to make a choice based on the little thumbnail and a short description. This is especially strange as you have hotel and room photos in the hotel info section and you could easily call for those upon that tap. 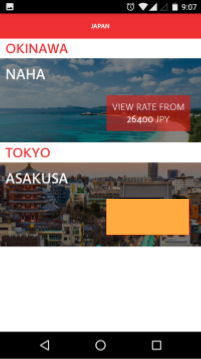 Speaking of the hotel info link: I would probably try adding it to the location selection screen, as it seems a little backwards: researching the hotel after selecting it and then going back. 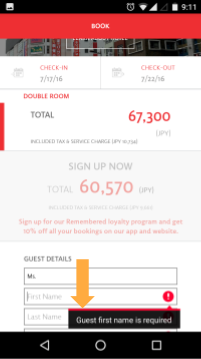 The booking screen is also a little spartan in terms of options: an optional text field for special request could be useful here (additional bedding, late check-in, etc.) – this would take away some booking anxiety from the users. The only option I saw was ‘breakfast’, and for some reason it’s a radiobutton instead of a checkbox, so after choosing it it’s pretty confusing how to un-choose it. What’s interesting is that you have a pretty big tool hidden in this section called ‘Local attractions’. It seems to list some spots around the hotel, but for any details it takes you to Foursquare. The purpose of this tool is unclear to me: either it’s expected to help make a decision to stay at the particular hotel or it’s a value-adder – it is too hidden. I would try developing it, bringing to the location selection screen (or somewhere where it could easily be found) and split-test how users interact with it: maybe noone uses it and it could be removed without regret. Also, speaking of options, I would announce payment options as icons somewhere prior to the actual payment screen as it may be one of the most important questions in the new user’s head while trying to book a room, and it only unveils at the very end. Moving gradually to the confirmation screen. 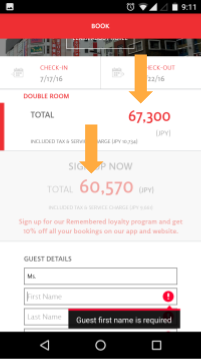 As I figured, signing up for a loyalty program in the app could make your booking cheaper. Making a reservation with payment at the hotel will make it more expensive. Logging in makes… unclear changes to the whole process. To figure it all out I had to actively play around the app, which 96% users will certainly not do. Why not give them those all those options in a clear fashion (especially as the pay-at-hotel price hike could become an unpleasant surprise for some)? The reddish ‘sign for loyalty’ text looks like a promo, while it is actually a link/button that takes you to the form, similar to the one for signing up. Why not make links and buttons more obvious and the form – universal? I would also add amount of guests to the confirmation screen as it could easily be forgotten while picking and choosing. The payment info ‘extension’ of the confirmation screen is pretty wise: the users do like to check and confirm what they’ve chosen before clicking the ‘pay’ button. The card-scanning option is also great and a must-have for any mobile e-commerce. But I found a couple of personal annoyances. 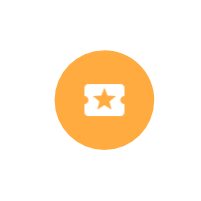 One of them – the ‘login’ link disappears as you click ‘continue’, and I can’t see a reason for it. The other – after missing a required field its notification will follow you forever, not letting you to even scroll away. 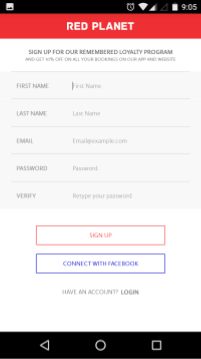 Plus, there’s an option to signup with Facebook – many users wouldn’t even know about it until deciding to do that anyway. And the ‘My account’ page just gives the user another set of buttons to click, while it could already be giving some fields to fill as default. Why are those pages different anyways?